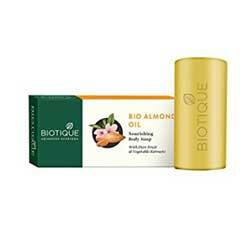 Biotique Almond Oil Cleanser. Pure Vegetable Soap for Dry Skin, free from skin problems. Almond Oil Cleanser - Pure Vegetable Cleanser - No Harsh Additives, Dyes or hardening agents. It is hypoallergenic and clinically tested. This Cleanser making involves the blending of traditional Ayurvedic formulae. Pure Vegetable Cleanser formulated with Coconut oil and Almond oil. Almond Cleanser is for skin that needs extra care. There are no harsh additives, dyes or hardening agents. It is hypoallergenic and clinically tested. Regular use makes the body free from skin problems like ringworm, scabies and dermatitis infection. Recommended by doctors for people with sensitive skin and skin that needs extra care. Apply appropriate amount to the skin. Massage gently. Gently work up a foamy lather, and rinse. Pure Coconut Oil and Almond Oil.